Challenge the status quo, change the face of activism, and confront climate change head on with the ultimate blueprint for taking action. Xiuhtezcatl Martinez is a 16-year-old climate activist, hip-hop artist, and powerful new voice on the frontlines of a global youth-led movement. He and his group the Earth Guardians believe that today’s youth will play an important role in shaping our future. They know that the choices made right now will have a lasting impact on the world of tomorrow, and people—young and old—are asking themselves what they can do to ensure a positive, just, and sustainable future. We Rise tells these stories and addresses the solutions. 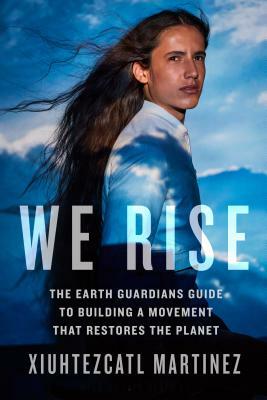 Beginning with the empowering story of the Earth Guardians and how Xiuhtezcatl has become a voice for his generation, We Rise explores many aspects of effective activism and provides step-by-step information on how to start and join solution-oriented movements. With conversations between Xiuhtezcatl and well-known activists, revolutionaries, and celebrities, practical advice for living a more sustainable lifestyle, and ideas and tools for building resilient communities, We Rise is an action guide on how to face the biggest problems of today, including climate change, fossil fuel extraction, and industrial agriculture. If you are interested in creating real and tangible change, We Rise will give you the inspiration and information you need to do your part in making the world a better place and leave you asking, What kind of legacy do I want to leave? Xiuhtezcatl Martinez is a 16-year-old indigenous climate activist, hip-hop artist, and a powerful voice on the front lines of a global youth-led environmental movement. At the early age six, Xiuhtezcatl began speaking around the world from the Rio+20 United Nations Summit in Rio de Janeiro, to addressing the General Assembly at the United Nations in New York. He is the youth director of Earth Guardians, an organization of young activists, artists, and musicians from across the globe stepping up as leaders and working together to create positive change in their communities to address climate change and other important issues that will define our future. He has traveled across the nation and to many parts of world educating his generation about the state of the planet they are inheriting and inspiring them into action to protect the earth. His movement has grown to over 2,000 youth lead Earth Guardian crews globally working on the front lines to combat climate change. His work has been featured on PBS, Showtime, National Geographic, Rolling Stone, Upworthy, The Guardian, Vogue, CNN, MSNBC, HBO, and many more. He lives in Boulder, Colorado.